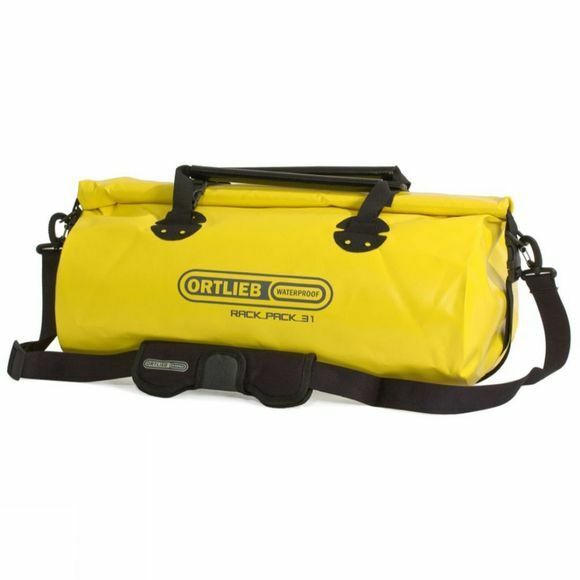 Supremely practical, the Rack Pack is the classic holdall shape, with a drybag-style roll-closure to ensure the water stays outside... or inside, if you're carrying wet gear! The really ingenious part though is in the combination of the two ideas: unlike many drybags, the Rack-Pack opens along the length of the bag rather than the end, so you get true holdall practicality. Great as a rugged piece of travel luggage in its own right, the Rack Pack also combines with Ortlieb's Roller series of panniers to create a versatile bike-touring setup.